Infectious singer Flavia Coelho is bold and striking in her songs and performance. 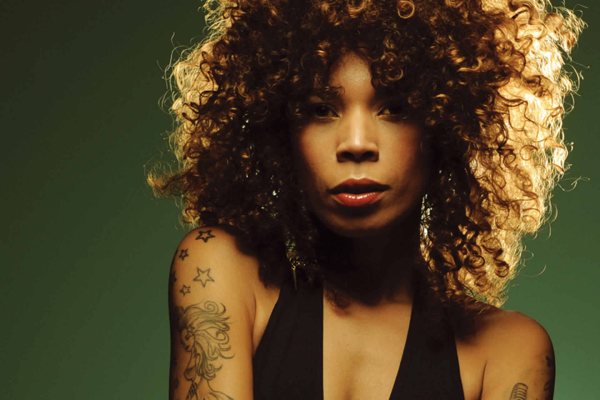 The Rio de Janeiro born Brazilian artist is based in France where she fuses the international sounds of rap, samba, ragga, reggae, hip hop and bossa nova . Coelho made a huge impact across Europe with her debut album Bossa Muffin. As the title suggests, she draws on the traditions of the samba and the bossa nova and the melodies of the forro from north-eastern Brazil, but she and her red-hot band work in ragga and hip-hop to create a stylish yet mischievous mix that takes the new Brazil to the world. "A traveler's diary." These are the words used by Flavia Coelho to describe Bossa Muffin. The image sticks to her album, springy and true to her joyful tumultuous life, ready to take on the world and experience the beautiful encounters that came her way. Bossa Muffin hits like a declaration of independence or a manifesto, albeit, one stripped of its dogmas and rules, a spontaneous musical movement, a virtuous celebration of cultural blending, globalization with a human side to it. Her upbeat and contagious second album Mundo Meu was released in 2015 and includes many specials guests. It contains songs that tell adventurous stories about the beauty and dangers of Brazilian life with lyrics about love, heartbreak, struggle, devotion, addiction and alcohol. Mundo Meu returns Coelho to the urban jungle of her roots with colorful native slang and some original, humorous and wonderful songs. Flavia has travelled many of the world's roads. From Rio de Janeiro's Favela 'morros' to the storied streets of Paris, this nomad feels at home wherever she's made welcome. Her current refuge and home-from-home is a cozy retreat where she can transform, chrysalis-like, to emerge with a fully-formed new album, her third: Sonho Real. Sonho Real glows with the colours of the butterfly. There are hints of forro and ragga, frenzied ska rhythms and a dub nonchalance. The 14 tracks on the album stand alone as individual statements but work in sequence and flow as one. In the liner notes, Flavia captures the essence of the album: "By definition our dreams are imaginary, however mine became real." Too subtle to be easily classified - Flavia is a woman of many faces, a sweet amalgam. Flavia transforms loss, suffering and failure into strength and recycles them into energy to drive to the future. She urges us to wake up, to see beyond our privileges, our comforts and our certainties. Please welcome Flavia Coelho for her first performance in the United States.